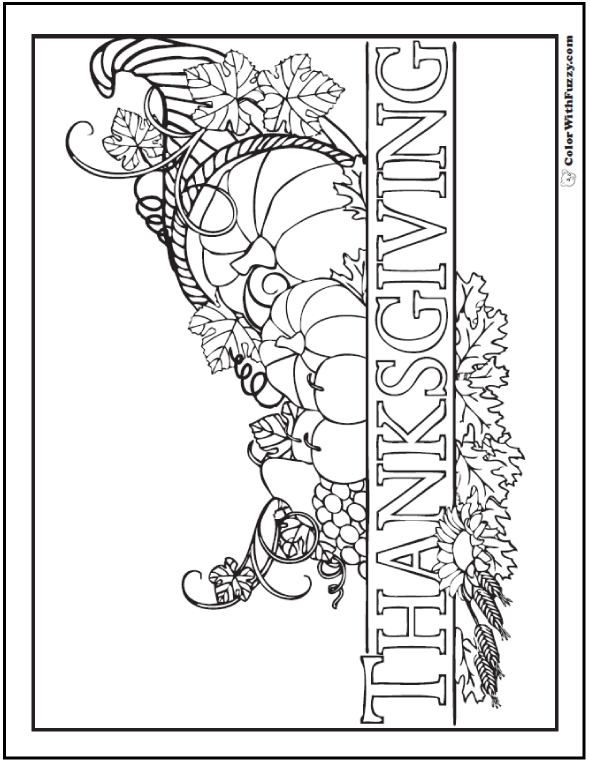 I love this fun Thanksgiving cornucopia banner to color. It has a bounty of pumpkins, fruits, grapes, wheat, oak leaves, and sunflowers. I like to hang it on my door or in my classroom. Print this Thanksgiving cornucopia banner. Thanksgiving cornucopia pictures are so cool! I love the wheat and the grape leaf curls. Happy Thanksgiving Day! I love this cornucopia filled with harvest treasures like pumpkins, wheat, pears, and grapes. It has fall decorations like sunflowers, grape leaves, and oak leaves. Sharpen your orange, yellow, red, and brown coloring pencils and crayons to color a bright autumn scene!